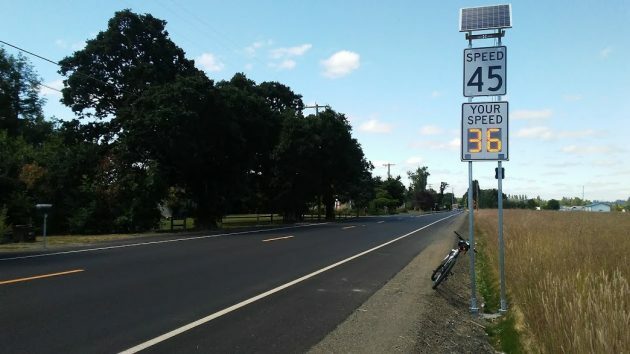 On the first day of summer, the bike took me south of town, out on Oakville and back on Riverside, where on the newly widened section I was delighted to discover solar-powered radar speed displays. Those things can be helpful to drivers who watch the road rather than looking down at the speedometer. The idea is to reduce speeding and prevent crashes. So Linn County has installed the displays — I counted three, but I may have missed some — on long straightaways where we’re all inclined to push the pedal down. The speed limit there is 45, which may seem a little low considering the excellent condition of the new, wider pavement. But the road is lined by farms and residences, so 45 is a sensible speed limit, especially now that there’s more truck traffic carrying containers to and from a straw-exporting operation on Walnut Drive. The city of Albany is preparing to install a radar speed display on Second Avenue S.E. to see if it works to slow traffic down. That one is supposed to be temporary, but on Riverside, from the looks of them, the county’s displays are meant to be permanent. They did put one on second avenue. I noticed it this morning. Furthermore, the sign on second street cannot be seen in the afternoon due to sunlight reflection. You can see the sign but not the speed. The good news is that this will not be a problem 9 months out of the year.